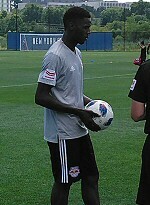 Anatole Abang, who last played for the team two years ago, has finally returned. The striker spent time on loan with Hobro in Denmark, SJK in Finland, and Astra Giurgiu in Romania. As first reported by Dylan Butler, he has joined today's training session. Didn't we say that we needed a backup forward?